Flexing muscles. And chomping them. Apart from the name, I’m also put off by the didactic strap-line. Call me perverse but when I’m eating out my focus is on sensory pleasure; I don’t want a menu wagging its finger and telling me what’s good for me. The first MMG opened in 1995 and there are now over 200 franchises. I guess that’s not a lot when you consider the size of the United States and compare it with MacDonald’s 14,000+, although they have had a 40 year head start. 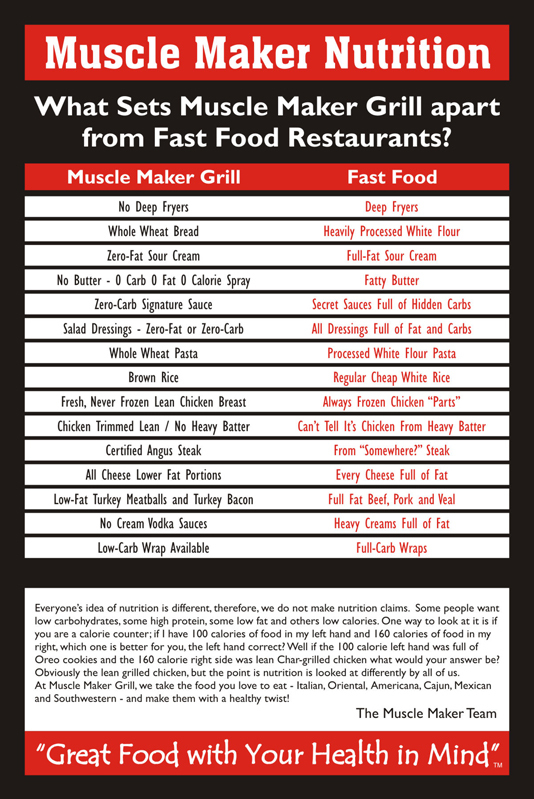 But MMG are offering an alternative to existing fast-food outlets and they have a nutrition poster that flashes up the differences. 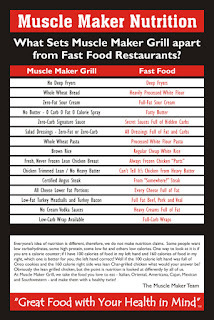 No deep fried food, whole wheat, lean meat without, they promise, compromising on taste. It sounds good so I should really push myself past the Charles Atlas ‘you won’t kick sand in my face again’ suggestiveness of the name and judge it on experience. There are a couple of things on the nutrition poster that annoy me though: no butter and zero-fat. And one thing that’s not on the poster (or on the website): any mention of sugar. Isn't it common knowledge by now that it’s not fat that’s making blimps out of everyone, it’s sugar, hidden sugar? (In my case it’s mostly the hidden sugar in wine.) And I don't want to eat a bunch of laboratory produced chemicals in its place either. Maybe I’ll email MMG and ask them for their line on this. But I suppose change is more likely to happen if it happens gradually. Cut out some of the rubbish we eat and replace it with healthier alternatives and once that change has transformed into habit, we can address others. So I should be more supportive of the MMG’s vision: it’s worthy, admirable, necessary even. And their food is the kind of food I like too: wraps, pasta, salads, asian flavours. I should peel off my skin of literary snobbishness and appreciate that they’re doing something positive, something good…. so how about The Good Grill instead? Write about what attracts you, what repels you. Write a list of things that make you healthy. Write about the sweetest thing you know. Write about a habit you want to shed, a habit you want to adopt.